Choosing between a Ford Ranger and Mazda B-Series is mainly a matter of styling details and price. Both the B-Series and its Ranger counterpart rank among the best in their class, but look also at the Chevrolet S10 or GMC Sonoma. Ford restyled its compact Ranger pickup truck for 1993. 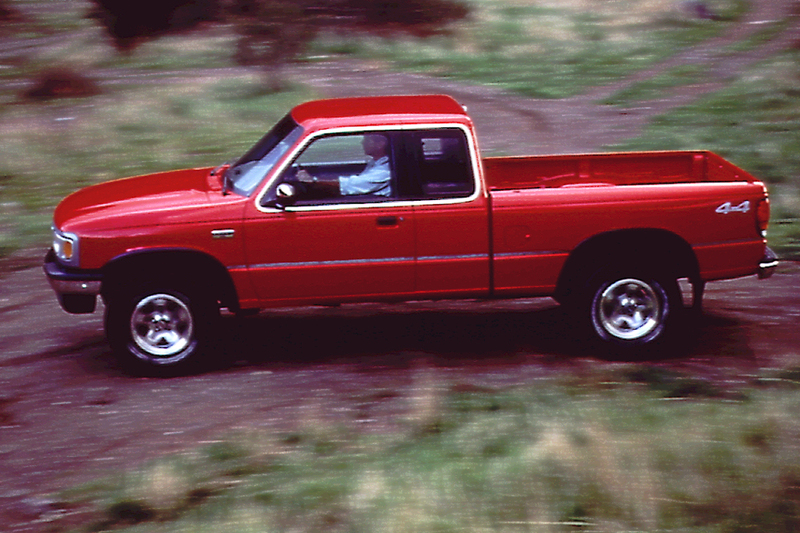 A year later, Mazda began to sell a variant of the Ranger as the B-Series. Matching the Ranger in basic dimensions, the B-Series had its own hood, grille, front fenders, rear quarter panels, and taillamps. B-Series trucks came in two cab styles and three wheelbases: regular-cab short bed, regular-cab long bed, and extended-cab. Three engines were available: a 2.3-liter 4-cylinder for the B2300 series, a 3.0-liter V6 for the B3000, and 4.0-liter V6 for the B4000. Rear antilock brakes and five-speed manual were standard; 4-speed automatic optional. All models could have either 2- or part-time 4-wheel drive. 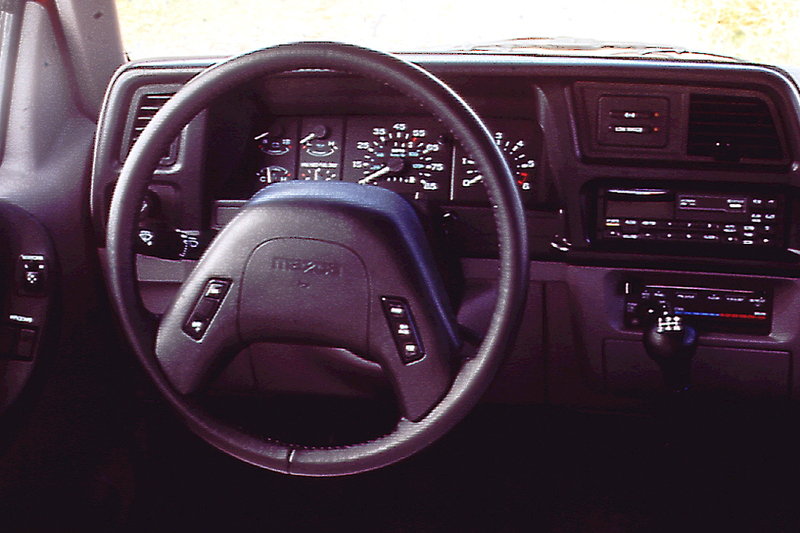 Both the B-Series and the Ranger gained a new dashboard for 1995, along with a driver-side airbag. Four-wheel antilock brakes became available (standard with 4-wheel drive and with the 4.0-liter engine). An optional passenger airbag came for ’96, complete with a disabling switch. A 5-speed automatic transmission became available with the 4.0-liter engine. The 3.0-liter V6 was dropped, as was the regular-cab model with a 7-foot cargo bed. 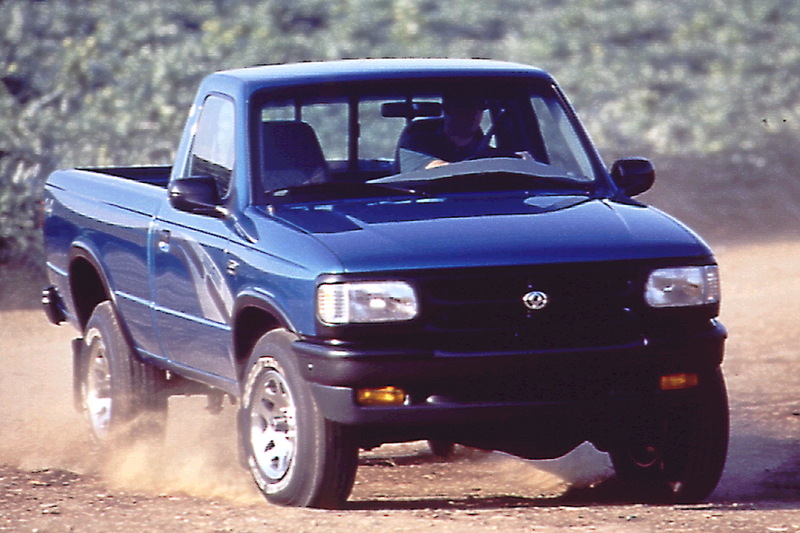 B-Series and companion Ranger would get restyled for ’98 with an optional 4-door extended cab model. 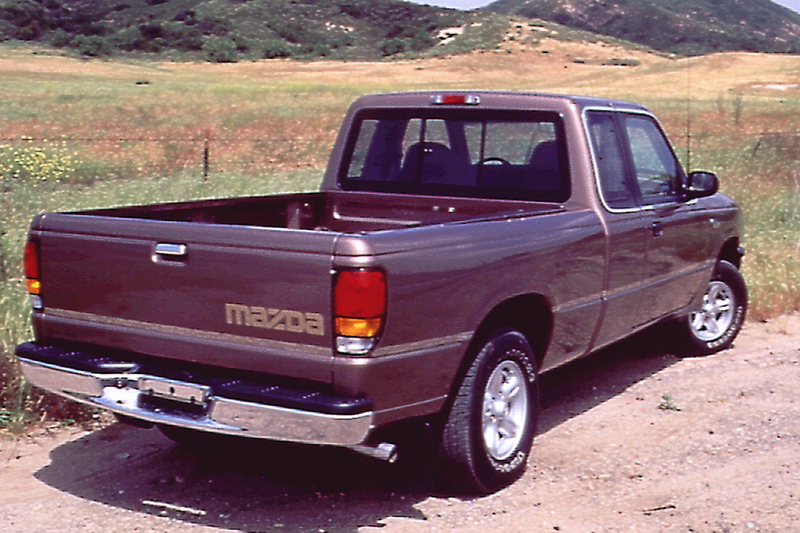 Mazda B-Series and Ford Ranger compact pickups each came with a choice of three engines: 2.3-liter 4-cylinder, 3.0-liter V6 (until 1997), or 4.0-liter V6. A 5-speed manual transmission was standard; 4-speed automatic optional. A 5-speed automatic transmission became available for 1997. The 4.0-liter engine is indeed the best choice, though most buyers will be satisfied with 3.0-liter V6, especially when equipped with manual shift. Using only a little more fuel than the 3.0-liter engine, the 4.0-liter V6 delivers good low-speed punch, though it can get coarse and noisy. A 4-cylinder engine provides acceptable power with the 5-speed manual gearbox, but is sluggish when driving an automatic transmission. It’s an unwise choice for towing or hauling heavy payloads. All models ride rather nicely, and road manners are good. You won’t be assaulted by undue tire, engine, or wind noise, either. Off-road setups make for a stiff ride on 4x4s, but suspensions on other models absorb most big bumps without jarring the occupants. Interiors are well-designed, though the rear jump seats are usable only by small children. 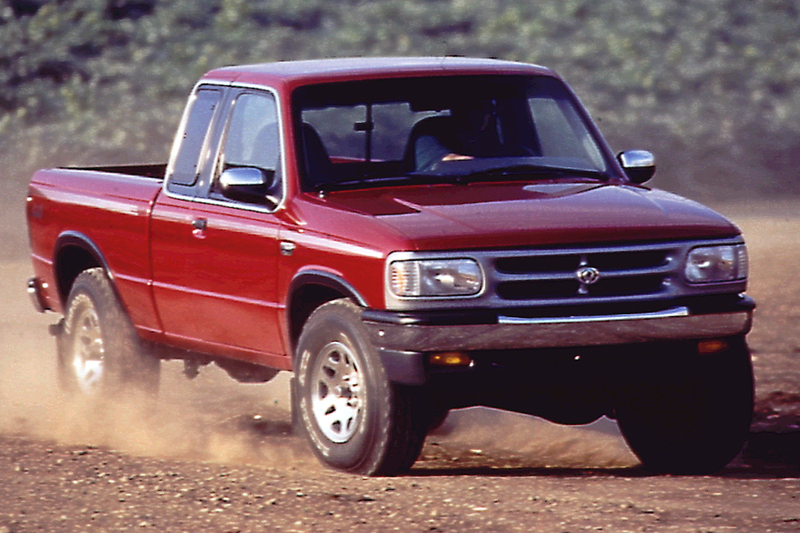 Ranger and B-Series were the only compact pickups to offer a passenger-side airbag, added for 1996 as an option. Description: Studs that attach master cylinder to power brake booster can develop stress cracking after extended period. Description: Parking brake might not hold. Description: Flexible hose in front fuel line is susceptible to cracking. Description: On vehicles manufactured on or before December 5, 2002, a component of the cruise control deactivation switch may deteriorate over time and develop a leak. This occurrence could cause the switch to overheat, smoke or burn which could result in an under-hood fire. A vehicle fire could occur with or without the engine running. Mazda will notify owners that dealers will install a universal fused jumper harness on the cruise control deactivation switch free of charge.